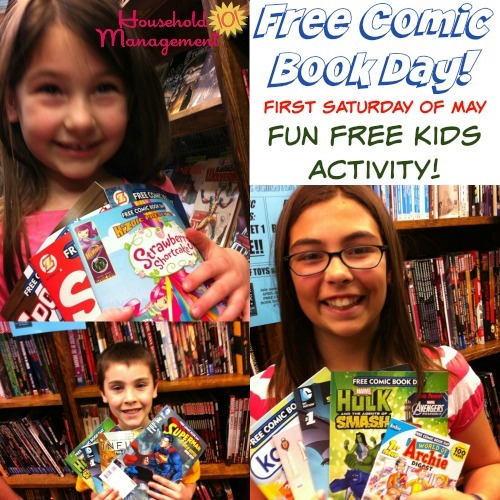 My husband and I have been taking our kids to Free Comic Book Day each year for years, and our whole family looks forward to this free kids activity each May. But when I tell people what we're doing on the first Saturday of May there are a lot of people who've never heard of this event. Well, I'm here to remedy that and get you excited to take your kids. Really, the name says it all. This is an event put on by participating comic book stores throughout North America, and really the world, where they, for one day, each year, give away free comic books. And yes, they are absolutely free. You can go in, choose from the selection of free comic books offered, take the ones you want, make your kids smile with delight, and leave without opening your wallet. Each store's policy is different, but we've been doing this for quite a few years, and in several different cities and different stores, and as you can see from the picture above our kids were able to choose quite a few each. Obviously if this is new for you, ask someone at the store what their policy is for how many free books you can get per person. This is an annual event, and it is always on the first Saturday of May. In our house, because that is the day the Kentucky Derby is always held as well, and I'm originally from Louisville, we get up, go to the comic book store, and then come how to have a little family Derby party. At this party, except for singing "My Old Kentucky Home" and two minutes of the actual horse race, my kids are engrossed in their free comic books. This is the big annual event for the comic book industry, and obviously their goal for giving away these free comics is to get kids to realize how fun comics are, and to grow to love them. My kids are huge fans of super heroes and comic books anyway, so this is really a no brainer for us each year, and bonus, it encourages them to read. Each year's selection is different. You can see a full list of the available comic books that will be given away for free each year here on the official Free Comic Book Day website. There are always a lot of free kid-friendly comics being given away each year. But this is not a kids only event, and there are also comics geared more toward teens or older readers. I personally just rely on my husband, who himself loves comics, to help guide the kids to choose the ones which are appropriate for them. In addition, most stores have the kid comics segregated into their own area to make it easier as well. But if you have any concerns my suggestion is to just check the list before you go, so you know which ones to tell your kids they can choose from. 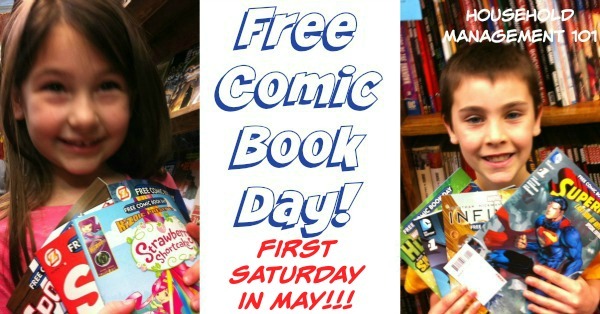 Speaking as a veteran of this event, here's my tips for making the most of Free Comic Book Day with your kids. First, get there early. These events are always very popular, and the stores can get crowded, and the best comics can get picked over. If your child has their heart set on one make sure to get there early. Second, you may want to check with your local comic book store to see if they are having any special events in conjunction with this event. Sometimes they also have door prizes, book signings, or other such activities to help engage the crowd. Finally, I mentioned that this event is absolutely free. That is true. But the comic industry, at least the printed books, is a struggling industry. So my husband and I tend to try to support these locally owned comic book stores by making a purchase when we take the kids for their free books. This is not at all necessary but I feel like it's something to at least consider, plus it makes my husband happy to get some comics too, so win-win! As I mentioned, to get the free comics you've got to go to a partcipating comic book store. Most do participate though. To find a store close to you that is doing Free Comic Book Day this year check this store locator. Have a great time this year at this fun free kids activity, and tell me below in the comments what you and your kids thought of it!